How low can Mondeo prices go? Okay, the 98R 2.0LX in the photo had don a serious 152,000 miles. But is was second-spec 1998 with a/c and a CD instead of a cassette player, it was attractive Petrol Blue metallic and it was all there, right down to a set of four unbroken wheel trims. Not long ago, to let the bidding start at £1,000 would have been a joke. But not today. 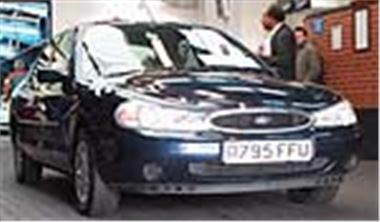 The car was reserved at just £1,400 and sold for £1,425. Up for a Polo? Not long ago, facelift models were making a mint. Today you could have had a sharp black 98R 1.4 16v with 82,000 miles for £3,900. Still a lot of money for a lumpy little car, but £1,500 less than it would have been in August. And, if the girlfriend prefers something bigger, that same £3,900 would have bought a 93,000 mile Honda Prelude 2.0i coupe painted the metallic blue they look best in. Jagwatching again, I saw four XJ8's pass the block: all 3.2s with alloys, air and leather. Lowest bid was £12,900 for a 42,000 mile 98S. Next lowest, £13,350 for a 29,000 mile 98R. £15,600 didn't quite buy a 9,000 mile 99S. While £14,600 secured the youngest car, a 99V with 62,000 miles under its wheels. I also spotted the cheapest S-Type I've yet seen. This one was a bog standard 99V V6 in solid British Racing Green with grey velour seats, 57,000 miles and the Barcelona (Manuel) box. It sold for £12,800. But some kit is still dear. Diesel Passats are showing a bit of a revival with £6,800 paid for a 71,000 mile 99V TDI 90 S and £7,450 stumped up to secure a 59,000 mile 99T TDI 90 S. But I had to suspend my diesel disbelief when a 9,000 mile 2000X Mercedes ML270CDI automatic trundled into the hall. Bidding kicked off at a rock solid £25,000 and went all the way to £27,400, so there still seems to be a market for them even though every driveway in St. Georges Hill now HAS to be occupied by a BMW X5.